Last night Tool played the Molson Amphitheatre in Toronto, marking the third time I’ve had an opportunity to see them perform live. And as I’m usually reminded at their shows, there are rock bands out there, and then there’s Tool. It’s truly an experience to seem live. I went to the show with 5 other friends, all of us die-hard fans. Our seats were in the front of the 300 section and off to the side, which is still closer to the stage than half way. Having seen many concerts at the outdoor Molson Amphitheatre, I knew not to expect anything acoustically; the PA system there is often mediocre. All considered, however, Tool sounded great last night. As is so often the case, the quality of the show is not always in the sound quality but in the precision of the performances, the amount of energy the band is willing to give out and the vibe given out by the crowd. Last night had all of these things in spades. Maynard, who is battling an illness, came out wearing a Leaf’s jersey. They opened with “Stinkfist,” “The Pot,” and “46&2.” Maynard was very animated and established a physical presence on stage that I’d never seen before. He would crouch over and spread his legs in characteristic fashion, lean into the mic, and then prowl around on stage. Maynard would often shift between singing duty and playing the keyboards. The set was quite minimal with two small video screens off the side displaying their usual artistic eye candy and clips from their videos. Above the band was a large black backdrop which was lit up with lights that created dynamic patterns. The floor could be lit up like a disco floor, as could a 6' wall that stood behind the band. These were used to brilliant effect. One specific moment comes to mind when they were playing “Lateralus” and the set was ablaze in fiery washes of orange and red. Musically the band was intense and creative, performing alternative intros and outros, constantly keeping the fans guessing as to what they were going to do next. As my friend noted during the concert, “Tool does whatever the hell Tool wants to do.” And that pretty much sums up what this band is all about. There’s very little that they do that can be considered cliché or run-of-the-mill. Even the way they position themselves on stage is unique; Maynard, the lead vocalist, stands far at the back next to Danny Carey, the drummer, while the two guitarists, Justin Chancellor and Adam Jones, stand out front. The highlight of the concert for me, oddly enough, was not a musical moment, but rather a moment when the audience took over to show their appreciation for the band. Late into the show Tool decided to take a break onstage. Danny moved himself away from his kit and sat on the stairs beside Justin and Adam. Maynard was lying down on his back next to them. After a few seconds the audience started to hold up their lighters en masse. Now, let me tell you, I’ve been to a fair share of concerts and I’ve seen the lighters go up time and time again – but nothing compared to last night. It was like looking into a sea of tiny flames as far as the eye could see. And this went on for what seemed an eternity. 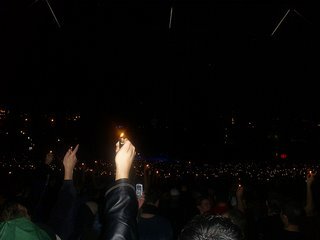 Even the members of Tool held up their lighters. It was truly a magical moment. Goosebumps. As for a musical highlight, it was “Lateralus” that moved me the most. Other strong songs included “Schism” and “10,000 Days.” They did not play any songs from Undertow, which for me was a disappointment. Man, I have a serious case of envy. I've been into Tool for a while now, but never managed to see them live. Maybe someday!